with added pewter overlays depicting cherries. Early in the 1920s Carlton Ware introduced its LUSTRINE range, which was available in twelve attractive colours. These plain lustre decorations were used on a wide range of shapes. Examples of LUSTRINE have been found with a pewter overlay as on the rectangular floating flower bowl on the right. Left - Chasing metal. 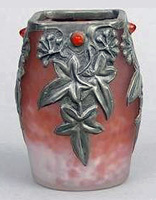 Right - A glass vase with repoussé overlay. The overlays were made using a technique called repoussé, where a sheet of malleable metal such pewter, copper or silver was labourously hammered into the desired relief. More decoration was added by chasing with metal punches. The pliable metal enabled the resulting form to be applied over the curved surface of a pot. Hot pitch or animal glue may have been used to attach the adornment. 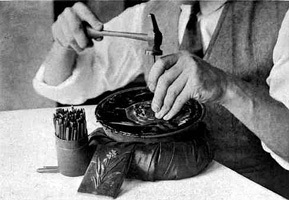 The same method was also used on glass, as shown on the left. Sometimes cabochons of glass or semi precious stones were incorporated into the pewter overlays adding to the attractiveness and cost. The cabochons are likely to have been bought in from a jewelers' supplier. Two examples are shown below. Left - Carlton Ware LUSTRINE	powder bowl with pewter overlay incorporating cabochons of agate. 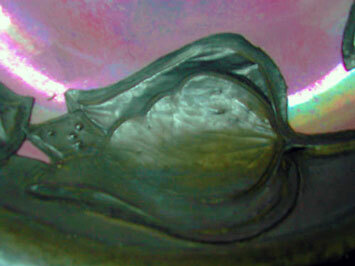 Right - detail from rectangular bowl with pewter overlay and blue cabochons. It seems unlikely that this elaborate work was carried out at Carlton Ware's Copeland Street works. Consequently, I suggest that it was done in workshops or studios elsewhere. But where might this be? Could it be Glasgow? 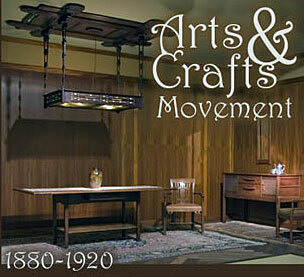 The Arts & Crafts movement. The pewter overlays are in the Arts & Crafts tradition and style. The suggestion that the pewter additions were made in Glasgow is speculative, but we do know that Carlton Ware supplied blanks to Elizabeth Mary Watt for subsequent decoration at her studio there. It is possible that Carlton Ware also supplied blanks to students at the Glasgow School of Art, which under the direction of Fra Newbury, 1885-1917, encouraged the decorative arts, including ceramic decoration, needlework and metalwork. This led to the setting up of independent studios and workshops especially in the Scottish city between the two world wars. We could also suggest that these Arts & Crafts inspired additions could have been made at many other UK locations. Below is a selection of Carlton Ware bowls with pewter overlays. A selection of Carlton Ware bowls with pewter overlays. Repoussé pewter detail on pink LUSTRINE. So far, except for one jug, and one vase from a later date, all pewter overlay on Carlton Ware has been found on bowls. Apart from LUSTRINE decorations, bowls with other lustre grounds have also been found with the metal embellishments. 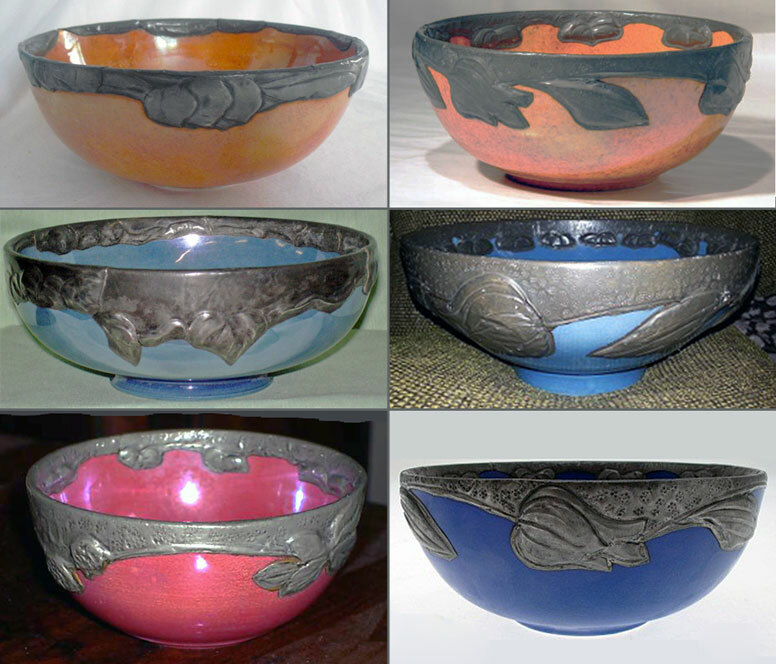 The two orange lustre decorations above used the earlier lustre, most often found on Carlton Ware's ARMAND LUSTRE range; the blue bowl, bottom right, used a matt glaze, which was introduced by the pottery c1928. The plain Carlton Ware lustre grounds work very well with the pewter and the composition probably looked even better when the metalwork was bright and reflective, not having the duller patina that it has acquired over what must be in excess of 90 years. If you have an example of Carlton Ware with pewter overlay then do send me a picture, or if you wish to comment then to send me an email. This website is image rich and is intended to be viewed on devices with larger screens such as tablets, laptops and desktops. Although it can be viewed on smartphones you will get a poorer viewing experience. Harvey Pettit © Copyright 2014. All rights reserved.